Sure, we tell kiddos -- you can be anything you want to be -- even President of the United States. But can they really? 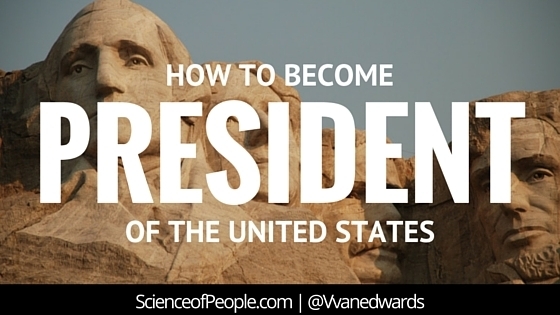 What does it take to be a U.S. President? Do you have to be rich? Charismatic? Smart? Male? A good public speaker? In the midst of an election year, I thought it would be interesting to do a small review on U.S. presidential personalities. Are you meant to play the starring role or the supporting role? A president should never eat humble pie for breakfast. A healthy dose of ego every morning would do a wannabe President good. And I don't mean ego negatively. Ego is different than arrogance. No matter how smart you are, how many good ideas you have or how many people you help, as President someone will always be upset with you. presidents are the constant target of criticism, and they are constantly beat up by the press, enemies -- and even allies. Ego is the only way to survive it. Sure, you get support, but you also have to own the ego to put up with the unavoidable hate that comes with power. For presidents, the campaign trail might as well be the Oregon Trail. Those who begin the adventure might not make it to the finish line. They might die or lose a limb on the way. They will sacrifice everything for the journey. And at the end, it's still the frontier. The finish is just the start. Campaigning is physically grueling work. Just because candidates are in suits and ties, don't forget that they are athletes. They make due on little to no sleep, have back-to-back events, speak to thousands daily and travel up and down the country every few weeks. Pioneers have to be willing to sacrifice time off, family time and vacations for their greater goals. Do you think an introvert could be President? In our modern era, presidents have to love the limelight, not just tolerate it. Think back to the first debate between President Obama and Mitt Romney. Obama nearly blew his campaign during that debate. Why? Romney felt comfortable. He relished the stage. He didn't seem rushed or hurried, and you can tell he felt it was a privilege to be there. See my full analysis of the debate here. Obama, on the other hand, seemed irritated and annoyed at having to be there. He came across as dismissive and superior as if he believed the debate was not worth his time and energy. It might not have been--he had other things to take care of like running a country. In that moment, he didn't need to show smarts, he needed to show celebrity. Schroeder describes this is a Showbiz Presidency. presidents of today have to be willing to go on talk shows, do reality bits and Funny or Die segments. They have to love the limelight. Voters can confuse a candidate's lack of desire for fame as a lack of desire to run. presidents either have to love every second of it or they have to be able to fake it. Reagan was once asked by a journalist about the transition from actor to president. He famously responded, "How can a president not be an actor?" No matter how much you like the spotlight, presidents still have to be able to perform on the spot. They need to be amazing at memorizing lines and full speeches. They have to be able to deliver impromptu anecdotes, they have to pretend to like people they despise and they have to be able to improvise through any situation. Acting is part of the job. Read a great essay on how all politicians are actors by the famous Arthur Miller: On Politics and the Art of Acting. Nonverbal Power: Like actors, presidents are also nonverbally directed and scripted. In fact, bad actor candidates are often so buttoned up that they seem fake. Think about McCain's fake smile or the classic picture of President Nixon shaking hands while looking at his watch. The reason why we love watching a president's body language is because it is the only place where we might get something real. Anyone can read a teleprompter, but it is very hard to control our microexpressions and body gestures. Body language is often the only thing voters have to see truth leaks. Social Proof: At the most basic level, a spouse shows the public that the candidate is loved. They are literally the #1 fan. When the candidate makes a joke on stage, the cameras always first pan to the spouse in the audience laughing. When the candidate makes an important speech, their husband or wife is right behind them smiling proudly. The spouse demonstrates how the public should feel about their significant other. Refuel: On the trail, a spouse becomes the home base. She or he is the rock where the candidate lays their head. They are the honest sounding board and the source of real feedback for the candidate to recharge. Teammate: One person can win a lot of votes, but two can win triple. You know how it's really hard to compliment yourself, but it's easy to brag about someone you love? This is even more important for presidents. Their spouses can fundraise, brag and show-off more than the president ever could. Schroeder shared one of the best stories about spouses. According to Schroeder, Bob Dole was a very serious speaker and had a hard time remembering to smile. During debates and presentations, his team placed his wife Elizabeth Dole right in his line of sight. She would sit their the entire time with a large smile plastered on her face so that when he saw her he would remember to smile. Yes, I put intelligence last. Why? Because it is the final ingredient that makes all of the others work. We have seen candidates who were incredibly charismatic and appealing on camera, but voters sniffed out the lack of intelligence. They couldn't last. This is the anchor puzzle piece. If you are missing this trait, the entire campaign falls apart. I don't believe intelligence has to be a high IQ necessarily, but it does mean being a quick learner and a strategic thinker. It means being able to learn lots of information rapidly, synthesizing it and finding the best possible answer. What do you think it takes to be a president? I would love to know who you think is the most charismatic president in our forums. Let me know!